In the recent ‘Compare & Contrast’ journal club, we had the pleasure of discussing two excellent papers based on the immunopathological roles of Toll-like Receptor 4 (TLR4). The two papers presented the importance of the localisation of TLR4 on stromal or haematopoietic cell types and their contribution in inducing pathology in different airway disease models. Toll-like receptor 4, is a pattern-recognition receptor that is expressed on array of cells and a common agonist for this receptor is Lipopolysaccharide (LPS), a sugar molecule highly expressed on gram negative bacterial cells1. The importance of TLR4 expression on immune cells such as granulocytes, neutrophils and eosinophils in driving an immune response against various pathogens has been published on extensively. Additionally, structural cells such as epithelial and endothelial cells have been shown to express TLR42. In many cases however, dysregulation of cell signalling from both haematopoietic and stromal compartments can lead to over-exuberant inflammation and subsequent collateral tissue damage and remodelling. TLR4 signalling is speculated to be important in contributing to hyper-inflammatory situations but whether this due to a direct effect of TLR4 expression on effector immune cells or an indirect effect of TLR4 signalling within stromal cells, is something that was addressed within the discussed papers. The first paper was ‘House dust mite allergen induces asthma via Toll-like receptor 4 triggering of airway structural cells’, by Hammad, H et al., published in 20093. This paper utilised irradiation techniques to eliminate host immune cells and leave structural cells such as airway epithelial cells intact within irradiated mice. They also performed bone marrow transfer experiments from respective Wild Type and TLR4 -/- mice to irradiated animals to produce mice that in turn either lack TLR4 expression on epithelial cells (Wild Type mouse bone marrow transferred to an irradiated TLR4 -/- animal) and mice that lack TLR4 expression on immune cells (Wild Type mouse bone marrow transferred to an irradiated TLR4 -/- mouse). 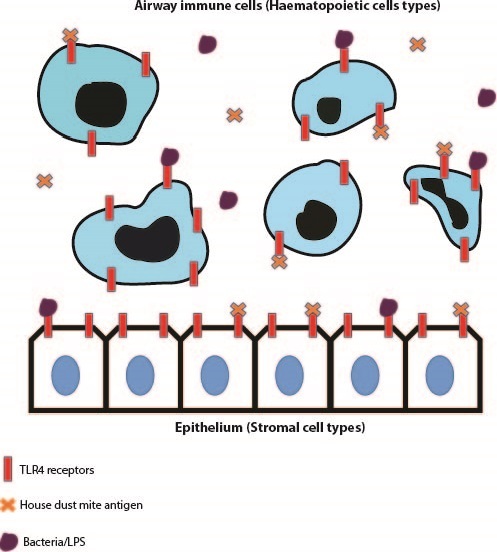 They used an LPS model of inflammation and a House Dust Mite (HDM) model of allergic airway disease to determine which of the examined cell types expressing TLR4 was critical in driving immunopathology. Both of these studies displayed that TLR4 expression on radioresistant airway epithelial cells was critical in driving both disease types. In the LPS model, the authors observed elevated neutrophil, monocyte and dendritic cell infiltration in mice with TLR4 expression in the epithelium. They then went on to display that TLR4 expression on epithelial cells was important in dendritic cell maturation which in turn aids the development of LPS-induced inflammation. In the House Dust Mite model of allergic airway disease, mice with intact TLR4 expression in epithelium developed elevated airway infiltration of key effector cells such as neutrophils, eosinophils and lymphocytes to a similar extent to that of Wild Type mice administered HDM. Additionally, upon administration of an intratracheally-delivered TLR4 antagonist (assumed to recapitulate blocking TLR4 expression specifically on epithelial cells), cellular recruitment and cytokine production was ablated to similar levels as globally deficient TLR4 -/- mice and mice lacking TLR4 expression within the immune compartment. The second paper discussed was ‘Distinct Tlr4-expressing cell compartments control neutrophilic and eosinophilic airway inflammation’,by McAlees, J.W. et al., published in 20154. This paper intriguingly concluded opposing findings to those observed in the Hammad paper. This paper avoided the utilisation of irradiation techniques and exploited genetic strategies to manipulate TLR4 expression on respective immune or structural cell compartments. TLR4fl/fl mice were crossed with Vav1-Cre mice to inactivate TLR4 on immune cell types. Additionally, TLR4fl/fl mice were crossed with Shh-Cre mice to remove TLR4 expression on epithelial cells. Upon administration of the TLR4 agonist LPS, TLR4fl/fl-Vav1-Cre mice had reductions in neutrophil recruitment, chemokines and other inflammatory parameters compared to respective TLR4fl/fl-Shh-Cre mice. This indicates that it is indeed TLR4 expression in the haematopoietic cell compartment which drives this immunophenotype. Similar to the previous publication, a House Dust Mite sensitisation and challenge model was exploited. Intriguingly the TLR4fl/fl-Vav1-Cre mice had reductions in neutrophils numbers but eosinophilic infiltration in the airways was unchanged, however eosinophil recruitment was ablated in TLR4fl/fl-Shh-Cre suggesting that TLR4 expression in haematopoietic cells is important in driving neutrophilic inflammation but TLR4 expression on the epithelium is critical in inducing eosinophilic inflammation in allergic airway disease. Similar findings to the genetic studies were recapitulated when the authors employed irradiation studies similar to that of Hammad et al. Although epithelial expression of TLR4 does indeed have an important role in driving eosinophil recruitment, the study found that immune cell expression of TLR4 was critical in driving the pathology in their respective LPS and HDM models of inflammation. Two papers with such contrasting conclusions led to extensive discussions within the group. There was a general inclination towards the recent McAlees paper, and the major reasoning behind this was primarily linked to the irradiation techniques employed. The major argument was the effect of radiation on the inflammatory status of structural cells post-radiation treatment and additionally bystander cells such as alveolar macrophages that may be left intact. Additionally bone marrow transfer techniques have also been linked with inducing inflammation alone. On the other hand, despite employing genetic manipulation, doubts were also raised about the specificity of compartmental deletion of TLR4 in the respective TLR4fl/fl-Vav1-Cre and TLR4fl/fl-Shh-Cre mice. Overall it was agreed that whilst impressive and inventive techniques were used to observe compartmental contributions to the pathology of a disease, there still is a need to develop better models to deduce such hypotheses. Hoshino, K. et al. Cutting edge: Toll-like receptor 4 (TLR4)-deficient mice are hyporesponsive to lipopolysaccharide: evidence for TLR4 as the Lps gene product. J. Immunol. 162, 3749–52 (1999). Saito, T., Yamamoto, T., Kazawa, T., Gejyo, H. & Naito, M. Expression of toll-like receptor 2 and 4 in lipopolysaccharide-induced lung injury in mouse. Cell Tissue Res. 321, 75–88 (2005). Hammad, H. et al. House dust mite allergen induces asthma via Toll-like receptor 4 triggering of airway structural cells. Nat. Med. 15, 410–6 (2009). McAlees, J. W. et al. Distinct Tlr4-expressing cell compartments control neutrophilic and eosinophilic airway inflammation. Mucosal Immunol 8, 863–73 (2015).